As a visitor to Australia or a local holiday maker wanting to travel in a cost effective way, we passionately refer to these people as 'Backpackers'. Come and experience our culture and travel the land filled with vast deserts, beautiful rainforests, sandy beaches & wide open spaces. Have you thought about how you are going to get from A to B? Choose a Campervan! Whether your intentions are purely for sight-seeing or wanting to incorporate employment to help you along the way, this Free eBook will assist you with discovering our beautiful country at a different speed. 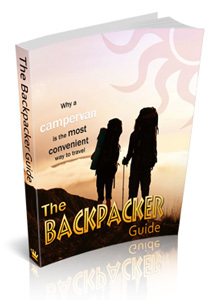 Take a moment to read The Backpacker Guide which will explain why a campervan is the most convenient way to travel.